Home / Archive / BBC iPlayer: new records set following "best ever year"
BBC iPlayer: new records set following "best ever year"
An average of 272 million programmes were streamed per month in 2017, making it the best ever year for the iPlayer. Total requests to the BBC's catch-up and on-demand service grew to 3.3 billion, up 11% on the previous year. The most popular show of 2017 was the first episode of natural history series Blue Planet II with 4.8 million requests. It was followed by the opening episodes of new Tom Hardy period drama Taboo and Doctor Foster series two. December 2017 was confirmed as the best ever month for the iPlayer, when the service saw 327 million requests, a 17% increase on the same month last year. Requests from connected TV devices are up 34% compared to December 2016. Also up year-on-year compared to December 2016 were requests from mobiles at 19% and computers at 3%. "Viewers are using BBC iPlayer more and more and in 2017 we made that experience better than ever. 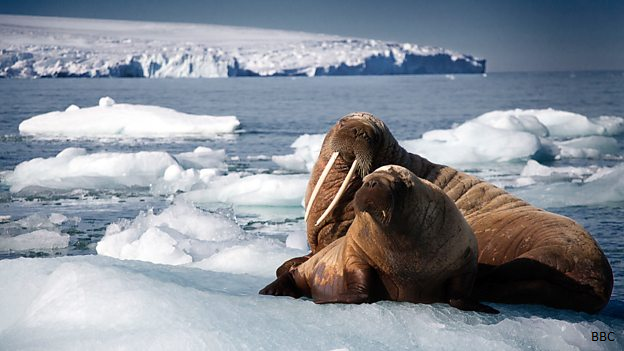 They delved into landmark factual series such as Blue Planet II and were enthralled by a breath-taking range of drama, from Taboo to Doctor Foster. Over the festive period we provided unexpected treats, bringing back some well-loved boxsets for people to watch in their own time. BBC iPlayer now offers a broader range of relevant choices personalised for all and it will get better still over the coming year." The BBC iPlayer first debuted in 2007. 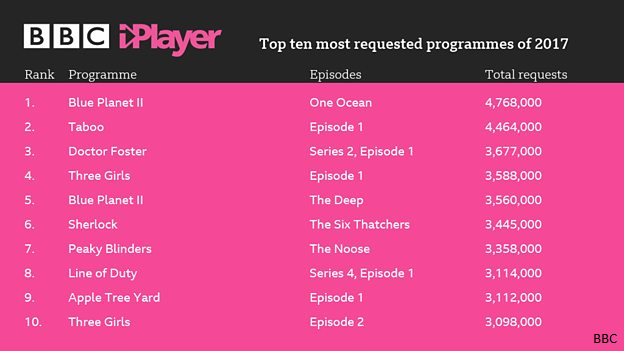 During the past year, the BBC has pushed of its output on to the service, with more iPlayer firsts and a longer catch-up period. In December 2017, the BBC brought back a number of older favourites for the Christmas and New Year period. The service also launched its first full Ultra HD series: Blue Planet II.